NASA, USAID and US State Department have recognized GOONJ as a ‘Game Changing Innovation’ after a world wide search and selection. GOONJ was called to NASA to present its innovation to a selected council of people. Our Cloth for Work and Not just a piece of cloth (sanitary pad) work got wide appreciation. GOONJ’s core philosophy of ‘building a parallel economy by using old material as a resource’ got wider acclaim. My heartfelt thanks to Team GOONJ; a bunch of young, energetic, creative youths for their trust and dedication!! And thanks to thousands of volunteers and well wishers all across for trusting the idea!! 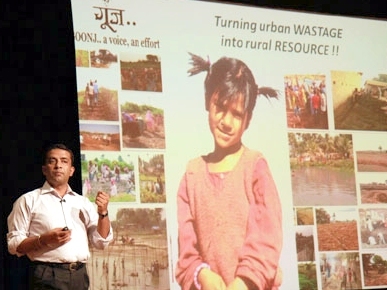 – Anshu Gupta (Ashoka Fellow)Founder Director – GOONJ..